NASA's TESS exoplanet satellite stands atop a SpaceX Falcon 9 rocket at Cape Canaveral Air Force Station on April 16, 2018. Launch was planned for this day, but a rocket issue has pushed it to April 18 at the earliest. CAPE CANAVERAL, Fla. — NASA's newest planet-hunting spacecraft will have to wait a bit longer to get aloft. 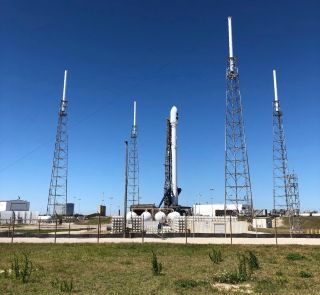 The launch of the Transiting Exoplanet Survey Satellite (TESS) — which was scheduled to take place this evening (April 16) here from Cape Canaveral Air Force Station — has been delayed by at least 48 hours due to an issue with the spacecraft's rocket ride, a SpaceX Falcon 9. TESS is designed to hunt for alien planets circling stars relatively close to the sun. The mission is expected to discover thousands of worlds over the course of its two-year prime mission, TESS team members have said. Some of these new finds will be near enough to Earth to characterize in detail using other telescopes, including NASA's $8.8 billion James Webb Space Telescope, which is scheduled to lift off in May 2020. Indeed, Webb should be able to hunt for possible "biosignatures," such as oxygen and methane, in the atmospheres of at least a few of the TESS worlds, NASA officials have said. TESS will follow in the footsteps of NASA's prolific Kepler space telescope, which has discovered 2,650 alien worlds to date — about 70 percent of all known exoplanets. Kepler will likely give up the ghost soon after it passes the torch: The older spacecraft is running out of fuel and probably has just a few months of life left, NASA officials have said. Like Kepler, TESS will use the "transit method" to find exoplanets, noticing the tiny dips in brightness when these worlds cross their parent stars' faces from the telescope's perspective. But TESS will orbit Earth (on a looping, 13.7-day path), whereas Kepler circles the sun.